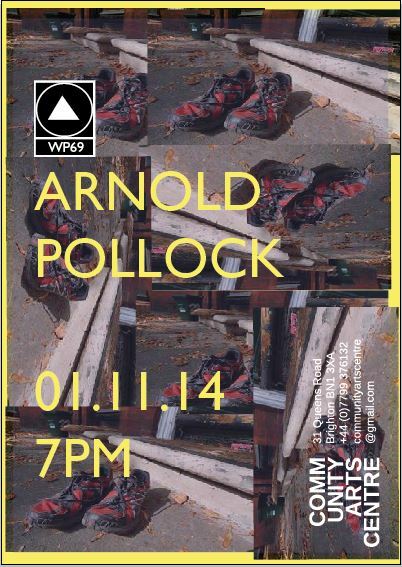 For the final week I invited Actor/Artist/Bodybuilder/Documentary Filmmaker Arnold Pollock to exhibit. His was a unique situation in that he is from Manchester so would be making work from scratch or using whatever he could bring down with him. But this gave Arnold the chance to truly create something in response to the gallery space as initially the space was all he had. Using his current interest in acting (he’s been on Corrie don’t you know!) and previous experience in documentary film making Arnold created a film that combines his interaction with Brighton and its inhabitants. He accurately describes the film as ‘… the result of pursuing every meaningful coincidence during my stay.’ Most of these coincidences revolved around, and occurred due, to his incredible charm. This charm made it possible for Arnold to swipe personal text messages off of strangers phones which are then used as scripts, acted out with new strangers. The film also depicts local scenes which perhaps locals would normally overlook, and all pretence is somehow stripped away from whimsical beach scenes such as in the clip below and replaced with an endearing honesty. It was the perfect way to end the residency. The film left me with a new love for my hometown and showed the true potential of CAC when someone enters it with a blank slate and only their interests as a starting point.